What is Finesse fishing? Finesse fishing is all about downsizing, going lighter than your normal approach and adapting your presentation to current conditions. Weather changes like a cold front, pressure fall or rain that is cooling down the water are all factors that can make good days of fishing go to worse. You need to adapt to these conditions to trigger fish that suddenly turns inactive and lethargic. Presenting a smaller bait than you would normally use seems to be the only way to get bit some days! Example; You are fishing a ledge for perch with a 3,75” Swimfish shad on a traditional jig head. Suddenly the skies open and rain pours down for an hour. The school of active fish on the ledge stops biting and you cannot find them. After making a sweep with your boat, you locate the school with your sonar. Now they have moved deeper, to where the ledge transitions to flat bottom. The Swimfish/jig head setup from before wont get you bit so you change to a dropshot rig with a tiny 2,5” Fin-S Fish. Statically fishing the dropshot rig exactly where the fish is holding up gets the fish biting again. This is, what I think, a true finesse approach! Another example, in this case in a pike fishing situation, is if your normal approach would be fishing a Pig Shad over shallow water. A cold front turns the fish off. Finding a way to trigger the fish is key because your standard lures wont work. Changing to a smaller lure and presenting it on a different depth to trigger fish into biting is in my opinion a finesse approach in a scenario like this. In my own fishing, when finding ways to trigger lethargic fish, I focus on making the presentation of my lure more subtle and natural. I think about the rate of fall and the speed I retrieve it. This is finesse fishing for me! Finding out my target fish starts feeding on small fish fry and changing to a lure the same size or color is called “Matching the hatch”, this is also a finesse tactic! As your lures gets smaller when downsizing to a finesse approach your line needs to be lighter not to inhibit the action of your lure. And for you to be able to cast these light lures and not snap the lighter line of, your rod needs to be lighter as well. It all goes hand in hand in finesse fishing! A dropshot rig can be fished with any type of softbait, sizes of lines and weight of sinkers. This super versatile rig can also be used in a finesse approach as mentioned in one of the examples. Rigging a 3” Ribster worm or a 2,5” Fin-S Fish on a size 2 Mosquito hook with a 7gr sinker is a superb finesse fishing technique! 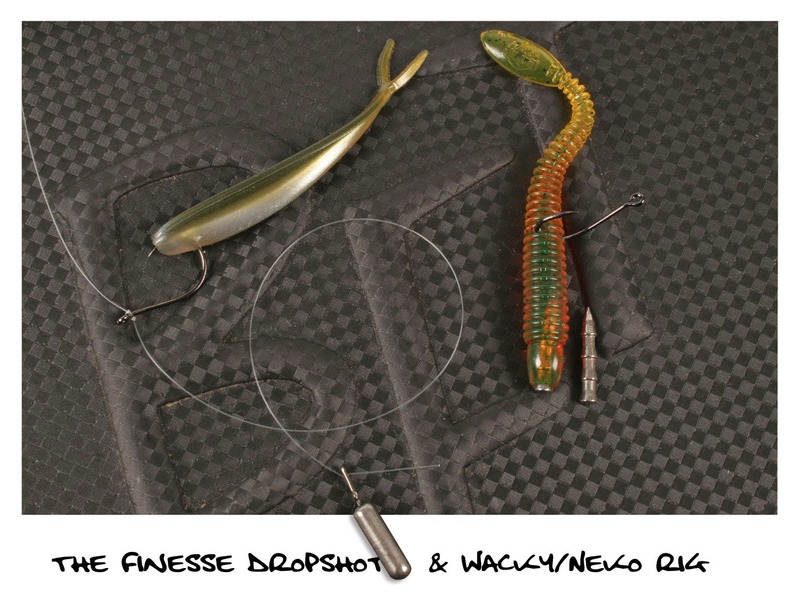 Another technique that calls for finesse is the “Wacky rig” or “Neko rig”. Using only a light wire single hook tied onto your mainline, you hook your chosen softbait (preferably a worm, Ribster is my choice) in the middle. The worm will move in a very peculiar way when shaking your rod tip and stay in the strike zone longer. If you put a nail weight in the nose of the worm it will sink nose down and can therefore be hopped along the bottom (Neko rig). Perfect for vertical structures and steep rocky ledges in clear water. These are my thoughts on finesse fishing. I believe it is not a name of a certain type of lure, nor is it a certain type of rod, reel or line. Finesse fishing for me is adapting to changing conditions by focusing on downsizing and presentation.